Last year I showed how Xtext 0.7.2 projects can be build with Maven. It requires the installation of all related plugins as Maven artifacts in a Maven2 repository, which is a rather hard and error prone task. I was asked many times since then whether I would install Xtext 1.0 artifacts or even milestone versions into the openArchitectureWare Maven2 repository. Although I can really understand this requirement my hope was that I could avoid this and show a way to enable the build with Maven Tycho. Now the time has come that Tycho is mature enough and finally I had the time to do the necessary extension for the Fornax Maven Workflow Plugin to support the recently added MWE2 workflow engine, which is used from Xtext now as default. Maven Tycho and the Fornax plugin will allow to build Xtext projects in the most natural way possible. A basic requirement for software builds is that everything can be build just from the sources. Also it is a good practice that no generated sources are checked in into a source repository. Unfortunately this often does not hold for Xtext projects, since it is a quite hard task to execute the Xtext generator in a build process. Yes, it is possible, but until now users often have to solve it again and again. Search the net, most projects seen there will just check in all the sources. The Fornax plugin and Maven will standardize this behavior. What do you need to enable Xtext DSL builds with Tycho? Not much. Basically a Maven 3 installation (the beta is enough) and access to the internet to access the public repositories. A better idea is to use a repository manager in the intranet (like Nexus) to act as proxy for the public repositories. You will have to add some POMs to your projects. That’s it. I’ll show now how to enable the basic project that you get from the Xtext project wizard get build with Maven Tycho. OS name: "mac os x" version: "10.5.8" arch: "x86_64" Family: "mac"
Select in Eclipse File / New / Project / Xtext Project and leave all the defaults. The project name should be org.xtext.example.mydsl for this tutorial. The projects will be created and almost empty for now. The aim is to get everything build by just adding the POMs. Again, set the imported packages to optional. Each project will get a POM file. A Parent POM will contain the common settings and will act as a reactor POM also. Normally the Parent POM is placed in the directory above the modules, or here the plugin projects. This would be the workspace root. In this example we will place the Parent POM in the DSL grammar project. To make builds easier this POM will have the default name pom.xml. On the other side we have to add also a POM for the grammar project itself. Since it will be in the same directory we have to find another name, and we will call it pom-grammar.xml. For the other projects (.generator and .ui) we will stay with pom.xml. The Parent POM configures the Tycho plugins and aggregates the grammar project, UI project and the generator. Also the required repositories are configured here. Note that the folder “src” is added as resource path, this will add this folder to the classpath. The workflow execution would fail if the workflow module cannot be found on the classpath. The build of the grammar project needs to execute the workflow src/org/xtext/example/mydsl/GenerateMyDsl.mwe2. All other settings are already managed by the parent. The build configuration of the UI plugin is even easier. Only the reference to the parent and the minimum project coordinates need to be configured. The generator plugin must execute its workflow. Note that the src directory and the compile directory of the grammar project are set as resource directory. Now the build should be executable. Run ‘mvn clean install‘ in the root of the org.xtext.example.mydsl project. Here is an excerpt of the console log you should get. The complete log can be viewed here. [WARNING] No explicit target runtime environment configuration. Build is platform dependent. It is recommended to use the ANTLR 3 parser generator (BSD licence - http://www.antlr.org/license.html). Now an automatic build is not so responsive to questions like these. The plugin will confirm this download automatically. If the Maven plugin does not execute the MWE2 workflow properly it is not so responsive at the moment to name the root cause. But when running the Maven command with “-X” it will output the full Java command including classpath to the console. Copy the full command and try to execute it from the same directory. This might help to detect the problem you have. 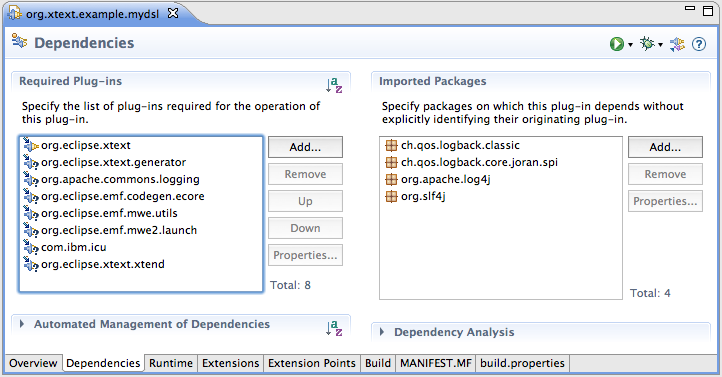 The Maven plugin org.fornax.toolsupport:fornax-oaw-m2-plugin is not released yet. Yesterday I have added the necessary support for MWE2 and deployed a snapshot version 3.1.0-SNAPSHOT. Some minor issues have to be solved before it will be released. The plugin forks a JVM with help of the Java ant task type. At the moment the output from the forked JVM does not get redirected to the Plugin’s log. This is one issue to solve for the Plugin before release. It makes debugging problems a bit harder, but when copying the executed Java command that you get from the debug output and execute yourself you get a better impression of the error. For your convenience you can download the example project here.